Vyoma Fadia is ecstatic to be serving DECA Ontario as one of the Chapter Development Officers for the 2018-2019 year! 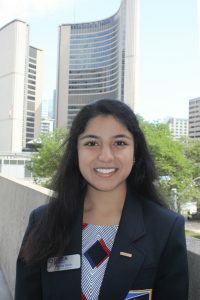 Vyoma is a grade 12 student at Earl Haig Secondary School, and has been a part of DECA for the past three years as an international competitor and Provincial Officer. From practicing the DECA handshake over 500 times, to exploring new cities with members across the globe, DECA has helped her hone her leadership and problem-solving skills while making unforgettable memories and lasting friendships. Outside of DECA, Vyoma is extensively involved in her school community as a part of Leaders Collective, the largest student body at her school with over 100 members. She helps coordinate activities such as Parent-Teacher Interviews, Orientation Day, and Financial Literacy workshops. She also enjoys playing sports such as tennis, soccer, and ping pong. Vyoma loves travelling, and is always ready to try out the newest ice cream and bubble tea places on BlogTO! Vyoma is beyond excited to make DECA Ontario’s 40th year one to remember for every single member. If you have any questions, concerns, or would simply like to talk, feel free to reach out to her on her social media accounts or at vyoma@deca.ca.